Since its beginning, the CEID has been pushing the bounds of engineering at Yale. This term, the Center continues this endeavor as it hosts the only course cross-listed in both music and engineering. The course, Musical Acoustics and Instrument Design, is taught by the CEID’s own Dr. Larry Wilen and the Department of Music’s Konrad Kaczmarek. The class covers topics ranging from the physics of sound waves to the design of musical instruments. The students aren’t just learning how these instruments work and building them; they are designing instrument after instrument and actually playing them! The CEID fills with sounds when the class meets. The first project involved building a xylophone in class and developing resonators for homework. After working on the xylophone as a group, the class moved on to strings. They started simple with a pluckable one-string instrument in class. 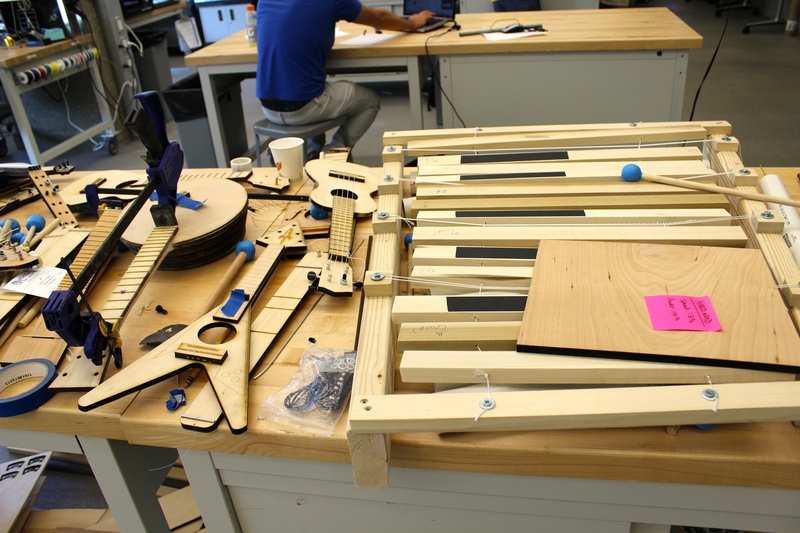 However, out of class, they turned to CorelDRAW and the laser cutter to design and make their very own violins, ukuleles, and more. The class table filled with instruments of all shapes and sizes: some that are plucked, some played with a bow, and others whose strings are simply hit. Each instrument is unique and produces a unique sound. From percussion to strings, the course has covered it. In their most recent project, the students have taken inspiration from saxophones and other woodwinds to build an instrument with the general shape and sound of a clarinet. The group learned where to position finger holes in order to play certain sounds, and the physics of mouthpieces, as they built their own. The students in the course aren’t just engineers: the course has attracted many musicians, with a large contingent of music majors, a cappella singers and ensemble members. The interdisciplinary nature of the course has gotten the attention of YaleNews, and even of the attendees of the NYC MakerCon. Check out this YaleNews article to see a performance on the xylophone and hear more about how the course has helped set a trend of collaboration between the arts and sciences. Musical Acoustics and Instrument Design has brought together a whole new variety of people into the CEID, and their xylophones, guitars, and woodwinds resonate throughout the space!